I've read better books by this author so don't write her off over this. 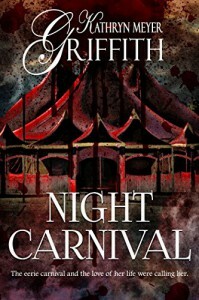 It's a short story about a carnival that only runs at night with, you guessed it, vampires! The problem isn't in the writing, but in the lack of research. Meyers doesn't seem to know the difference between a carnival and a circus and has melded the two into one, which doesn't work that way in real life. Yes you can do anything you want in fiction, but the believability is lost on this one. Besides, I think vampire romance has been overdone.